Handsworth Parramore saw their Northern Counties East League title hopes dented in a 4-2 home reversal against an in-form Staveley MW side who made it five wins from the last six. 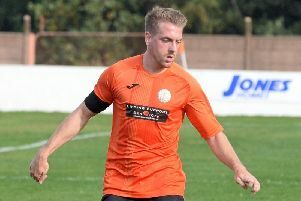 The Ambers got off to afine start as they looked for the win that would have seen them go second in the Premier Division. Bruno Holden latched onto a first minute Kieran Scargill flick to round the keeper and squeeze the ball home from a tight angle to give the home side the lead. But Staveley went straight back down the pitch to level as Courtney Hastings found himself in space to stab home. Archie Sneath made a fine save to prevent the visitors taking the lead but it was only a short reprieve when from the resulting corner Hastings was on hand to nod in at the back post in the 14th minute. Handsworth penalty appeals failed when Simon Harrison went down in the boxand six minutes minutes before the break theywere left with a mountain to climb as the visitors went 3-1 up after Adam Scott applied the finish to a well-worked move. Handsworth were back in the game on 53 minutes as substitute Kieran Wells made an instant impact with a well-struck shot that the Staveley keeper couldn’t hold and there was Holden to knock in the loose ball for his second. The goal lifted the home side and Scargill was unlucky not to level when his shot hit both posts before being gratefully gathered by the keeper. Holden and Gareth Griffiths both had headers cleared off the line but with seven minutes remaining Staveley broke to seal the three points as Steve Carty pounced from close range as the visitors made amends for the 6-0 FA Cup exit at the hands of Handsworth back in August. With leaders Tadcaster Albion not playing, Worksop Town missed out on the chance to go top of the table as Retford United twice came from behind to salvage a 2-2 draw at Cannon Park. The Tigers got off to a great start with Kyle Jordan’s 21st goal of the season - a low strike from the edge of the box in the fifth minute. Jordan almost doubled it with a fine effort from distance that the home keeper was forced to push wide. Despite dominating Worksop were pegged back eight minutes from the interval when Jason Bradley nodded home a cross from the left. Jordan ought to have put Worksop back in front on 66 after getting in on goal only to blaze over the bar. With 15 minutes remaining however, the Tigers regained the lead as Steve Woolley’s effort found the net through a crowded area. Four minutes later it was all square again, Adam Lee coming in at the back post to slot home from a floated cross over the defence. It could had been worse for the the Tigers had it not been for a superb save from debutant goalkeeper Aaron Ramsdale, who pushed Brad Johnson’s shot over to deny the home side a late winner. First half goals from McCauley Shilito and Joe Thornton 10 minutes before the break saw Athersley Recreation extend their unbeaten run to four games with a 2-0 home success against Nostwell MW and with it a league double. Depleted Armthorpe Welfare were no match for promotion hopefuls Cleethorpes Town who ran out comfortable 4-1 winners. After they trailed 2-0, Luke Norbury gave Welfare hope on 66 minutes when he pulled one back midway through the second half, finishing off a well-worked move at the near post for his first goal for the club. But Town responded with two late goals to put the result beyond doubt. Two of the First Division’s promotion contenders met at Church View Road where Penistone Church and AFC Emley fought out an entertaining 1-1 draw. The visitors looked set for three-points when Ashley Flynn pounced on 72 minutes to give Emley the lead with his 51st goal of the season. But with just seconds remaining Penistone grabbed a share of the spoils when Lewis Dickinson curled in a beauty from 22-yards. Dronfield Town made it three without a defeat following a 1-1 draw at Teversal. Blake Owen had given Town an eighth minute lead only for the home side to hit back just past the half hour for Teversal’s fourth draw in the last five games. Rossington Main suffered a fourth straight defeat, a narrow 1-0 reversal at promotion chasing Bottesford Town.